The co-pilot of a Sichuan Airlines flight that was forced to make an emergency landing on Monday was "sucked halfway" out of the plane after a cockpit windshield blew out, local media reported citing the aircraft's captain. Captain Liu Chuanjian, hailed as a hero on social media after having to land the Airbus A319 manually, told the Chengdu Economic Daily his aircraft had just reached a cruising altitude of 32,000 feet when a deafening sound tore through the cockpit. The cockpit experienced a sudden loss of pressure and drop in temperature and when he looked over, the cockpit's right windshield was gone. "There was no warning sign. Suddenly, the windshield just cracked and made a loud bang. The next thing I know, my co-pilot had been sucked halfway out of the window," he was quoted as saying. "Everything in the cockpit was floating in the air. Most of the equipment malfunctioned ... and I couldn't hear the radio. The plane was shaking so hard I could not read the gauges," he said. The co-pilot, who was wearing a seatbelt, was pulled back in. He suffered scratches and a sprained wrist, the Civil Aviation Administration of China said, adding that one other cabin crew member was also injured in the descent. None of the plane's 119 passengers were injured. An investigation into how the incident occurred is underway. The flight, Sichuan Airlines 3U8633, left the central Chinese municipality of Chongqing on Monday morning and was bound for the Tibetan capital of Lhasa. 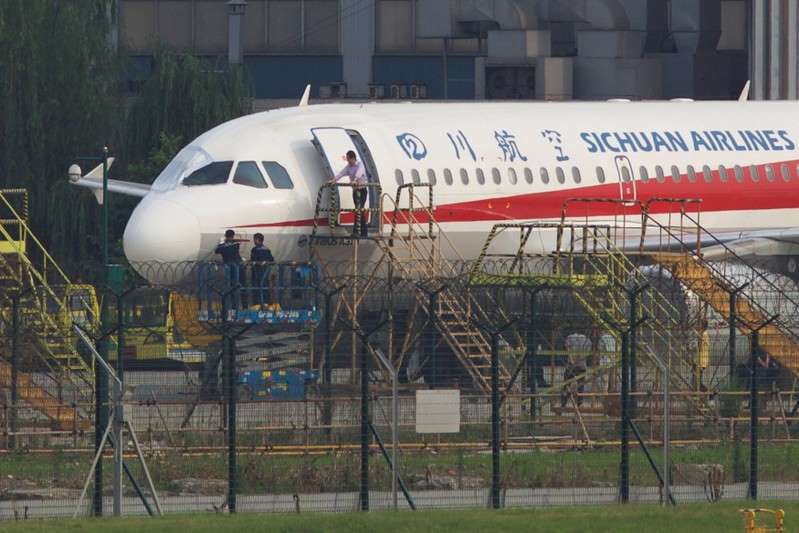 It made its emergency landing in the southwest city of Chengdu. "The crew were serving us breakfast when the aircraft began to shake. We didn't know what was going on and we panicked. Then the oxygen masks dropped... We experienced a few seconds of free fall before it stabilized again," an unnamed passenger told the government-run China News Service. "I'm still nervous. I don't dare to take an airplane anymore. But I'm also happy I had a narrow escape." The windshield shattered about half an hour after the plane took off at 6.25 a.m. local time (1025 GMT), the Chengdu Economic Daily said. A separate report said the aircraft had accumulated 19,912 flight hours since entering service at Sichuan Airlines in July 2011.